The Enemy Release Hypothesis links exotic plant success to escape from enemies such as herbivores and pathogens. 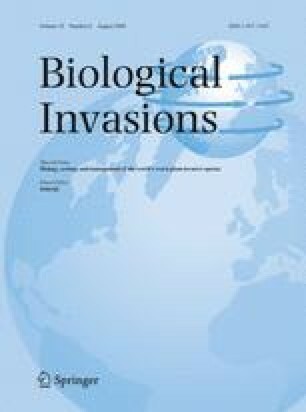 Recent work has shown that exotic plants that more fully escape herbivores and pathogens are more likely to become highly invasive, compared to plants with higher enemy loads in their novel ranges. We predicted that highly invasive plants from the Asteraceae and the Brassicaceae would be less acceptable, in laboratory no-choice feeding trials, to the generalist herbivore the American grasshopper, Schistocerca americana. We also compared herbivory on invasive and non-invasive plants from the genus Centaurea in no-choice feeding trials using the red-legged grasshopper Melanoplus femurrubrum and in a common garden in the field. In accordance with our predictions, highly invasive plants were fed on less by grasshoppers in the laboratory. They also received less damage in the field, suggesting that they contain feeding deterrents that render them less acceptable to generalist herbivores than non-invasive plants. We thank Ray Callaway, Giles Thelen, Joe DiTomaso and Andrew Kulmatiski for providing Centaurea seeds. Greg Sword kindly provided eggs from the Sidney, Montana USDA-ARS Schistocerca americana colony. We also thank Edward Bruggink for help in the greenhouse. This work was supported by the Natural Sciences and Engineering Research Council of Canada.